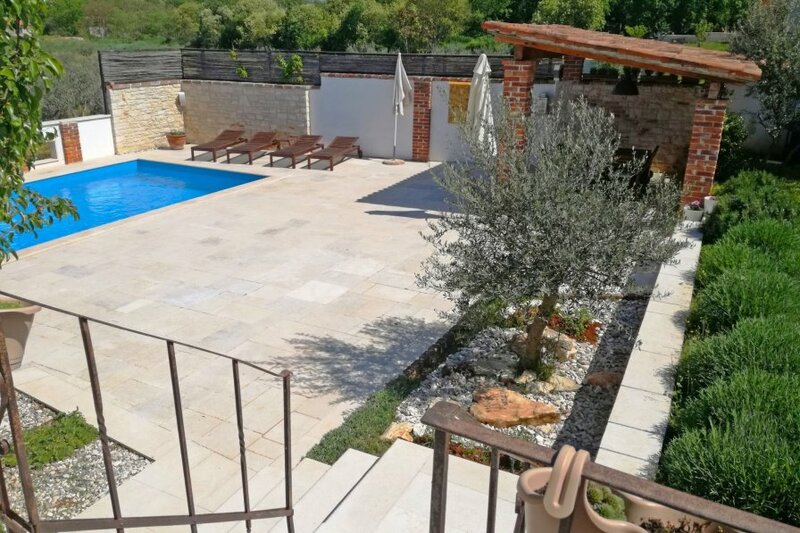 This 3-bedroom villa for up to 8 guests is located in Novigrad and has a private swimming pool. Beautiful single-family house Villa Mimosa, 2 storeys. In the hamlet Velika Stancija 2 km from the centre of Novigrad, in a quiet, sunny position, 2 km from the sea, 2 km from the beach. Private: property 884 m2 (fenced), garden with lawn and wildlife garden, swimming pool angular (8 x 4 m, depth 150 cm, 20.04.-12.10.). Outdoor shower, volleyball, terrace (12 m2), garden furniture. In the house: internet access, washing machine. Available: bicycles (4). Parking (for 4 cars) at the house on the premises. Supermarket 2 km, restaurant 1 km, pebble beach 2 km, rocky beach 2 km. Riding stable 8 km, walking paths from the house 50 m, cycle lane 100 m. Nearby attractions: aquapark 3 km, Cave Mramornica 5 km. 4-room house 130 m2 on 2 levels. Living/dining room 40 m2 with satellite TV (flat screen), air conditioning. Exit to the garden, to the terrace, to the swimming pool. 3 rooms, each room with 1 french bed (160 cm, length 200 cm). Open kitchen (oven, dishwasher, 4 ceramic glass hob hotplates, microwave, freezer, electric coffee machine). Bath/bidet/WC, shower/WC. Upper floor: open gallery with 1 french bed (180 cm, length 200 cm), air conditioning. Exit to the terrace. Terrace 20 m2, roofed, terrace 18 m2. Terrace furniture, barbecue (portable), deck chairs. Distant view of the sea and the countryside. Facilities: iron, children's high chair, baby cot, hair dryer. Internet (WiFi, free). 1 small pet/ dog allowed.